Home • USA the East • Massachusetts • '06 Aug: Cape Cod Click HERE and all the pictures will get big. We spent most of the day in Lexington doing chores and getting ready to go. It surprisingly doesn't take long at all to get here, just to get out of the house! A part of the living room and dining room. We arrived past 7 pm with light for another hour. We unpacked and put everything away, Les cooked. Elizabeth and David won't be coming until tomorrow because David had another performance, the cast party, and the not to be missed co-ed sleepover hosted by the play's coordinating parents. I am standing now in the living room of the Cape Cod Beach House looking out through the screen door to the veranda and the glassed dining corner. The bbq is to the left. The house is a total rustic charmer almost entirely as it was when it was built in 1904. We enjoyed a bottle from Les's yummy collection, as we will again I'm sure! Oh boy oh boy I can't wait to see what tomorrow will bring. I woke up this morning about 9:30 to find coffee ready and breakfast and the NY Times procured. All I had to do was nothing. Then we drove for a few miles down the road and walked a bit on this path to come to an amazing swimming lake. The life guards. Nice summer gig if you can get it! Les swam across the lake and back twice. I was majorly impressed. I swam out to the middle and back and thought I had gone far! It was a cool-ish grey day, lovely given the previous heat waves, and the water temperature was the same as the air. It was clean and fresh and utterly sublime. ...and this is the house next to the one on the left. Makes you want to sing that song about Old Cape Cod! This is the dock belonging to the guy on the right. I met him - nice guy - and I visited with another nice guy at the lake, and met a set of neighbors out for a walk. It seems a most neighborly neighborhood, despite that the house we are staying in is always occupied by short term renters. It was grey and cool all day and if cool means grey I'll not complain. Meet Lila My Lady. This is Les and Elizabeth's dog and I've been waiting for a decent photo to introduce her. She is such a lovely dog, so sweet and well behaved, and she loooves to play ball. Here's another day, just like the other day. Walking, swimming, enjoying meals, reading, playing with the dog, chatting, doing the occasional chore. This shot is from the road looking to the back of the place where we are staying. There are these fingers of water all along the coast. 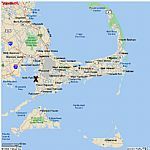 I'm pretty sure we're right around the 'x', on Buzzards Bay, and you can see why we're getting sunsets over the water. Notice how the whole cape is laced with inlets making water front homes of all description. Elizabeth in the glory that is Cape Cod. Sunset from our veranda. The first night the clouds were so thick sunset passed without my noticing but last night and tonight were bonk-o sunsets. And we've got 11 more to go! Les goes out shopping every day to acquire fresh food for our sumptuous meals. These guys are called stuffed quahogs and every fish market has their own personal offering. Soak bread in water. Dice and saute onion and quahogs. Drain bread, add to sauteed ingredients with spices and ketchup. Simmer until moist. Cool and stuff between quahog shells. Tie with string and bake 1 hour at 350. 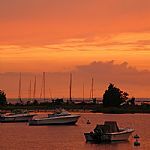 New activities include bike riding on the marvelous bike path that leads to a little harbor town where the Woods Hole Oceanographic Institute resides as well as a National Oceanic and Atmospheric Administration facility. The path leads through these conservation lands, opens onto bay views, and then goes into the town of Woods Hole. Local theater. What fun. The College Light Opera Company is a repertory group that sets up each summer here on Cape Cod. We saw The Mikado and next week we get to see something else. Never a dull moment! I'm simply mad for this lake where we swim every day. In the lower right quadrant you can see the break in the trees where a kid is swinging out on a rope ready to make a happy crash into the water. I went around back to the kick-off point. The kids can climb on a make-shift platform or up on this tree. You can see the rope in his hands. And he's off! It's a whole civilization out here with just the kids to manage themselves taking turns, retrieving the rope for the littler ones, not getting killed. I could hardly believe it - no parents around. How cool. I realize the contradiction since I was in fact there, but just for a few minutes, ok, and there was plenty of 'take My picture!' He did that twisty face the camera move just for the shot! The boys ogling the girl. Of course. Les just having swum Three times back and forth across the lake. It's about a mile and he did it in 57 minutes of continuous swimming. That's amazing! This scene was right outside our front door. It's so East Coast. Canadian geese in flight - coming or going, what do we Californians know. I could watch Winged Migration again. It was excellent. Here's the neighborhood stop 'n shop a few blocks from the place we are staying. It's a pretend country store. It's really a hip and trendy mini-Whole Foods. Les says it's a mini-Gelson's which is more correct (expensive and 'high-end' rather than expensive and 'natural') but Gelson's I'm afraid has seen it's day in the face of the Whole Foods onslaught. There is much less pretend at this guy's stand. There are malls and supermarkets around but also you can get great fresh food at produce places like this, from fish markets, and bakeries. Yummy! Corn is also warm off the stalk. Yummy! Oh man I just looove this lake where we swim every day. Today I was the first one to leave a towel. Good thing Elizabeth bought those $2 towels at the Christmas Tree Store a few days ago. Lila My Lady, having now laid claim to the once forbidden couch she is hence the Queen of the couch. Why do I always choose these goofy looking pictures of myself? Because they all turn out goofy? Because I am goofy? I can't think of another better explanation. ...and that's the shower! It is quite glorious to stand under the as-hot-as-you-want-it water with the wet warm breeze pouring through the slats in the shower stall. Ahhh! At one of the roadside stands. This momma's got a lotta little babies. What is she thinking? We haven't had an orange sunset since nights 2 and 3 and here we are at night 9. This is lovely though, calm, in colors that are meant to soothe the soul. Lila is one of those girl-dogs that Worships her people. And her people are the people who happen to be around. LoveMeLoveMeLoveMe. The daytime: enjoy a cup of coffee and cereal, read the NY Times and the Boston Globe, take a nice walk, swim in the lake, eat a yummy hot dog, shower, read, listen to my French lessons. The evening: tidy up, do The Dinner, visit, mess around with my computer, sleep. Here's Elizabeth and Lila The Dog and another color of sunset..
...and a couple of joggers stopped and about tore the camera out of my hands to take this picture. 'Oh this is just purrfect' they cried. This is my least favorite hair, all helmet, no curl. Oh well. Those Flags of America are big, and everywhere. You'd think it was July 4th. But it's not and they are telling us something here on Old Cape Cod. You'll notice from the map that Cape Cod is laced with these waterways, inlets, lagoons, marshes, and plenty of other vocabulary that hasn't come right to mind. Almost all waterfront, of which there are many more miles than miles of road, is, unlike in my own California home-sweet-home, private. Even the beaches are private. If you don't have beach property you are funneled into some very isolated spots and contained from roaming out of bounds by ropes and buoys. We walked down here from our place, which was nice but h.o.t. and once here as you can see there is no shade. Hot sun and no shade means turn-around time for me! This afternoon I took Elizabeth for her first time ever pedicure. It was a belated party for her 60th birthday since I couldn't make the real festivo. We sat in massage chairs and read trashy magazines. It is so cool that even at Sixty Years Old you can still be delighted by something new. Happy Birthday Elizabeth! Then for dinner we went to Betsy's Diner. The sign says Eat Heavy and it speaks for itself. This is dawn. I woke up at 5am, turned my head to look out the window and voila! My room is in the back of the house and this body of water is a little pond-like extension from the main channel out front. I need to take back some of what I said about all the beachfront being private. It is true in this area but there are large tracts of pubic access beach further north. Provincetown, P-Town in the local parlance. You'll want to look back at the map above and notice that Cape Cod Bay is surrounded by land shaped like the letter U. The left arm of the U is connected to the mainland and the tip of the right arm is Provincetown. With no traffic it takes 1 1/2 hours to get to P-Town from where we are staying and on weekends the road is a miles and miles long parking lot. That heatwave I was feeling so pleased about missing back home has come to find me. I cannot escape. No one could believe it was so hot. H.O.T., 100 degrees right here. It was HOT in case you forgot from the previous slide, so about all we did was walk to lunch, get ice cream, and see this, the Pilgrim Monument. I read you could climb to the top but that wasn't about to happen. From their website: "The Pilgrim Monument was founded in 1892... Its purpose is to commemorate the Mayflower Pilgrims’ first landing in the New World in Provincetown, in November 1620. Here the Pilgrims spent 5 weeks exploring the tip of Cape Cod, before they sailed on to Plymouth. They also drew up and signed the Mayflower Compact, which established the rule of law for the new land. "...President Theodore Roosevelt laid the cornerstone in 1907. In 1910, President William Howard Taft dedicated the finished 252-foot tower. In 1910, the Cape’s first building built to house a museum opened at the base of the monument, to educate the public about Provincetown’s role in Pilgrim history and American history." Look what I got! Kaitlin and her MOM! Hi Angela, thanks for the photo, great shot d. Snuggle Snorgle KissKiss! Sun RISE. Les paid a king's ransom to charter a private fishing boat with a Captain and a First Mate both devoted to expending all their considerable energy making sure these guys catch fish. We motored out to the fishing grounds at about 18 knots and it took over an hour to get there. Shoals are a prominent feature of this area creating breakers out at sea and much of the ride was real roller-coaster fun. Notice the horizon is straight and the boat is very Not straight. We got some rockin' and a rollin' out there! We all took the recommended dose of Dramamine before leaving. I spent some focused time doing deep breathing exercises and manning the horizon. After the first 2 hours I was feeling quite ok, but not ready to let down my guard! I heard one of the guys on the radio telling his colleagues that he'd be heading in early because he had a few Martians on board. Martians, I learned, are Little Green Men and you do not ever ever want to be one of them. You're looking at First Mate Evan who coached the team through the catching of fish. Les, David, and Evan. Good job boys! Mike taking a shot for his own website at Eastwind Charters. They caught these two big stripped bass and also two smaller but still pretty honkin' bluefish. After the Photo-Op Evan cleaned them all up into fillets and we took them home in plastic bags. I did have a fish on the line once. But he got away. Too bad too since he was <........T.H.I.S........> big! The mighty hunter returns from his toils. L&E had some friends over for a really Fresh Seafood Feast, and there's enough for another lunch and another dinner too. The dinner guests Mya, a compatriot of Les, and her boyfriend John who was being judged for his boyfriend suitability as Les takes a rather proprietary interest in Mya's well-being. From all accounts John was deemed acceptable and now the follow-up matter is, exactly what are his intentions? Then sunset came and I took this pano from the front porch. And then the sky darkened and the light changed and slowly (about a dozen pictures later!) it turned into this. Who could believe this? I'd say 'not possible'. But yes, possible, it's real as life. It's like a dream I think. What a fond farewell! Tomorrow is a travel day and then, bonjour, we're off to Montreal!